May the Spirit of Christmas have influenced you to strive to be a better person, caring and sharing with all whom you may meet. Let us all try even harder to have Peace on Earth and Goodwill to all men. Indeed, MERRY CHRISTMAS everyone - from Judy & John. As you may or may not know, our lead up to Christmas this year saw an incredible numbers of online purchases and we, unfortunately, ended up very short staffed, so December has not been easy. A wonderful customer sent me a beautiful e-card for Christmas which summed it up admirably. Mary gave me permission to share it with you - view it till the end as her message was ever so true. Thank you Mary. View my card HERE. It does take a little while to download, be patient, it is worth the wait. Here's a little Christmas Song with a different message, done with humour. Enjoy the CHRISTMAS CAN CAN. Ours is mid-Summer, so usually very hot. This is a great poem - hope you enjoy. 'Twas the night before Christmas; there wasn't a sound. Had settled down to watch TV sports. But a rusty old Ute pulled by eight mighty 'roos. And encouraged the 'roos, by calling their names. Now, Kylie! Now, Kirtsy! Now, Shazza and Shane! On Kepper! On, Skipper! On, Bazza and Wayne! I'll scoot down the gum tree. Be back in a wink! 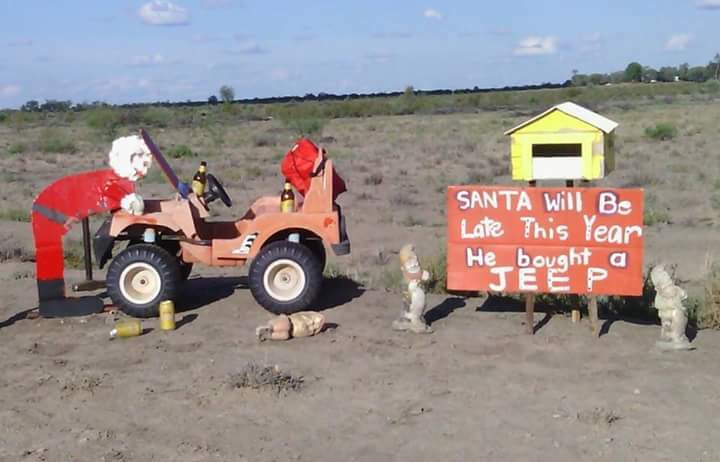 With the Ute full of toys and Santa Claus too. His eyes - bright as opals - Oh! How they twinkled! And for Dad, tongs to use on the barbeque. Then he turned and he winked and he held up his thumb. 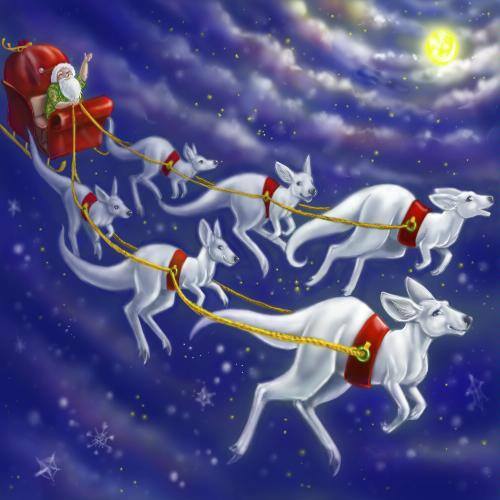 MERRY CHRISTMAS to all, and goodonya, MATES! Here are some good Aussie images from social media that made me smile. The unique welcome at the front gate, made of tyres, was from Liz Godfrey in Qld. The middle reflects an advertisement on TV recently that because Santa bought a Jeep, his chore of delivering presents was so much faster and easier. Trust Aussie humour to have this scene on their property. 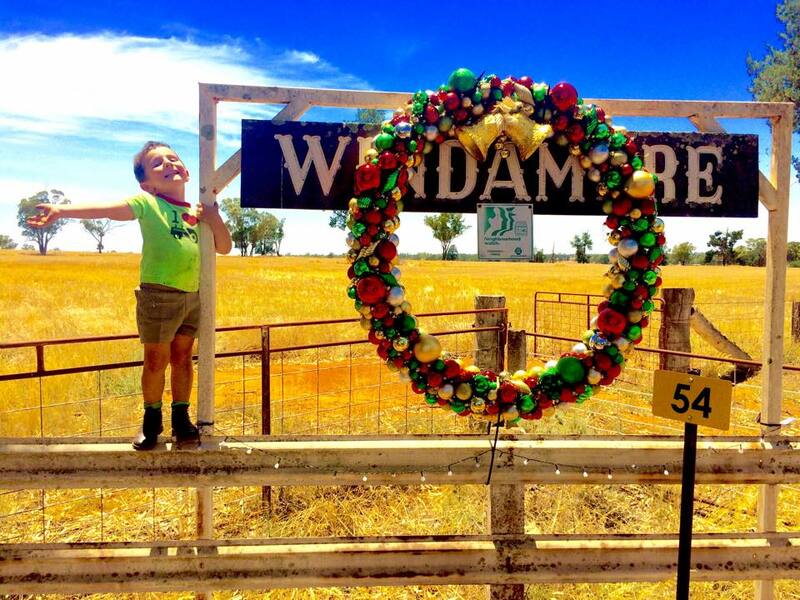 The third one is from one of my relatives, showing Brax proudly saying that even though Daddy was so very busy with harvest, he spared me 5 minutes to put up our Christmas Wreath at the front gate.